Dubai, UAE; January 21, 2019: In a move to support Dubai’s vision to become a disabled-friendly city by 2020, Mall of the Emirates has introduced an easy access to wheelchairs at all its key entrances for people of determination. The shopping and lifestyle destination has always offered wheelchairs free of charge at its Customers Service Desks but has now gone a step further to add to the convenience of its visitors by making them available as soon as they enter the mall. “As Dubai gears up to realise its ‘My Community’ vision for 2020, which aims to turn it into a friendly city for people of determination by eliminating obstacles to their inclusion, we want to do our part and set a positive example by enhancing convenience for them so that they have a pleasurable experience and create great moments with us. 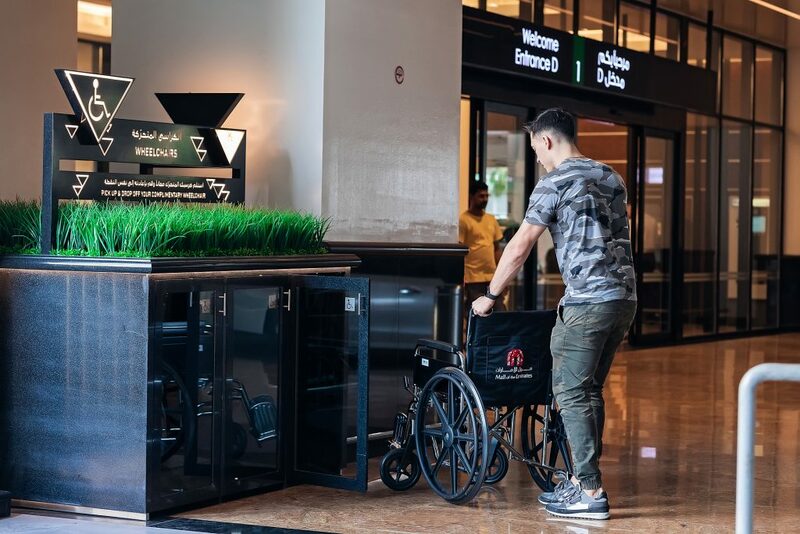 We don’t want visitors to have any trouble gaining access to a wheelchair, which is why they are now readily available for anyone to borrow at our entrances,” said Hussain Moosa, Director for Mall of the Emirates at Majid Al Futtaim – Properties. Designated wheelchair cabinets with signage can be found at all the entrances of the mall. Visitors can borrow a complimentary wheelchair to enjoy the diverse shopping, dining and entertainment options with ease and drop it off at any entrance on the way out.